I had a massive fanboy time this morning, as I went on my long-awaited (nearly 14 years) pilgrimage to Anfield, home of the Liverpool Football Club. As I had mentioned in my post last night, this was the explicit purpose of my visit to Liverpool, and I had left home with only three bookings – train to Liverpool, hotel in Liverpool and the Anfield tour. So after having polished off a “large Full English” (in hindsight, I’m thankful for that) at a local cafe close to my hotel, I took an Uber to Anfield. The driver was also a Liverpool fan and we spent time chatting about last afternoon’s game, when Liverpool played insipidly to draw across Stanley Park with Everton. I was in good time for the tour (that was to start at 11), and spent the time walking along the outside of the Main Stand. There are benches dedicated to Liverpool’s greatest players of all time, and the floor is tiled with names of members (not all members I think – perhaps those that made contributions to rebuild the Main Stand 3 years ago). I paid my respects at the Hillsborough Memorial and walked back to the Kop end where the entrance to the Stadium Tour is situated. The tour started on the sixth floor of the newly redeveloped Main Stand (if you’ve wondered why TV broadcasts of Liverpool games suddenly started showing a very high angle, this is the reason). Our guide Terry first took us to the hall where there were photos of “Liverpool’s six great managers”. The choices were interesting – Shankly, Paisley, Fagan, Dalglish, Houllier and Benitez. As the Elo ratings show, these were all definitely managers who improved Liverpool, sometimes in a significant way (though the last two also let things slip considerably towards the end of their reigns. I sensed some sort of discomfort in the group. Evidently, a majority were Liverpool fans, but talks about “the purpose of the club being to win trophies” and talking up of the number of trophies won so far brought up the painful reality that we’ve “AJMd” on a league, a europa league and a champions league in the last five years itself, and look on course to AJM the league once again. Nobody really wanted to point out that things aren’t going as well as we would like. In any case, the tour moved on and our guide Terry was excellent, though sometimes he went back to familiar cliches. Describing the miracle of Istanbul, for example, he made the familiar joke of “Milan had Kaka, and we had Djimi Traore, and yet we managed to win”. We moved on to a view of the pitch from the highest tier of the main stand, my first impression was that this is a rather “cosy” stadium. Now, the only other stadiums I’ve been to are the behemoths Camp Nou and Wembley, and in comparison to them, Anfield looked rather intimate. That also suggested why the crowd at Anfield is sometimes like “Liverpool’s 12th man”, as a poster outside the away dressing room claimed. The small stadium means the crowd noise can reverberate easily around the stadium. The Anfield Road End is yet to be redeveloped, and once that happens the stadium will become “taller”, meaning the noise levels might get higher. Looking at the pitch from up the Main Stand gave me another regret – that I haven’t watched a game at Anfield (though I did watch Liverpool play at Wembley). Hopefully sometime in this lifetime I’ll fulfil that! There were cutouts of various players placed near the dressing rooms. Salah’s was the most popular as everyone lined up to take a selfie with him. Rather than waiting there, I managed selfies with cutouts of all of Firmino, van Dijk and Alisson. The dressing rooms were impressive (especially the Home dressing room). I also found the differences between home and away dressing rooms interesting – the home room is soundproof while the away room isn’t. The home room has lighting control to adjust the lighting to the pitch. The away room has no such facilities. These are subtle differences we don’t appreciate as TV viewers, but can have a profound impact on the game. And based on this, I don’t mind the draws at Manchester United and Everton that much! This morning, I discovered the Club Elo Ratings, and promptly proceeded to analyse Liverpool FC’s performance over the years based on these ratings, and then correlated the performance by manager. Then, playing around with the data of different clubs, I realised that there are plenty more stories to be told using this data, and they are best told by people who are passionate about their respective clubs. So the best thing I could do is to put the data out there (in a form similar to what I did for Liverpool), so that people can analyse how their clubs have performed over the years, and under different managers. Sitting beside me as I was doing this analysis, my wife popped in with a pertinent observation. Now, she doesn’t watch football. She hates it that I watch so much football. Nevertheless, she has a strong eye for metrics. And watching me analyse club performance by manager, she asked me if I can analyse manager performance by club! And so I’ve added that as well to the Shiny app that I’ve built. It might look a bit clunky, with two unrelate graphs, one on top of the other, but since the two are strongly related, it makes sense to have both in the same app. The managers listed in the bottom dropdown are those who have managed at least two clubs in the Premier League. If you’re interested in Premier League football, you should definitely check out the app. I think there are some interesting insights to be gleaned (such as what I presented in this morning’s post). This morning, I found this tweet by John Burn-Murdoch, a statistician at the Financial Times, about a graphic he had made for a Simon Kuper (of Soccernomics fame) piece on Jose Mourinho. Burn-Murdoch also helpfully shared the code he had written to produce this graphic, through which I discovered ClubElo, a website that produces chess-style Elo ratings for football clubs. They have a free and open API, through which Burn-Murdoch got the data for the above graphic, and which I used to download all-time Elo ratings for all clubs available (I can be greedy that way). So the first order of business was to see how Liverpool’s rating has moved over time. The initial graph looked interesting, but not very interesting, so I decided to overlay it with periods of managerial regimes (the latter data I got through wikipedia). And this is what the all-time Elo rating of Liverpool looks like. It is easy to see that the biggest improvement in the club’s performance came under the long reign of Bill Shankly (no surprises there), who took them from the Second Division to winning the old First Division. There was brief dip when Shankly retired and his assistant Bob Paisley took over (might this be the time when Paisley got intimidated by Shankly’s frequent visits to the club, and then asked him not to come any more? ), but Paisley consolidated on Shankly’s improvement to lead the club to its first three European Cups. 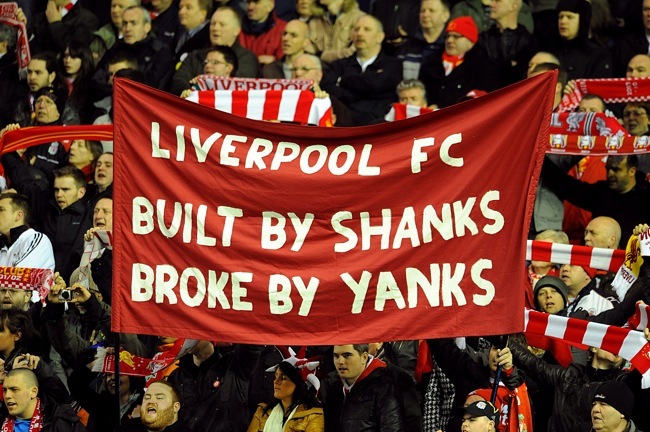 Around 2010, when the club was owned by Americans Tom Hicks and George Gillett and on a decline in terms of performance, this banner became popular at Anfield. The Yanks were subsequently yanked following a protracted court battle, to be replaced by another Yank (John W Henry), under whose ownership the club has done much better. What is also interesting from the above graph is the managerial change decisions. At the time, Kenny Dalglish’s sacking at the end of the 2011-12 season (which ended with Liverpool losing the FA Cup final to Chelsea) seemed unfair, but the Elo rating shows that the club’s rating had fallen below the level when Dalglish took over (initially as caretaker). Then there was a steep ascent under Brendan Rodgers (leading to second in 2013-14), when Suarez bit and got sold and the team went into deep decline. Again, we can see that Rodgers got sacked when the team had reverted to the rating that he had started off with. That’s when Jurgen Klopp came in, and thankfully so far there has been a much longer period of ascendance (which will hopefully continue). It is interesting to see, though, that the club’s current rating is still nowhere near the peak reached under Rafa Benitez (in the 2008-9 title challenge). We see, for example, that Chelsea’s ascendancy started not with Mourinho’s first term as manager, but towards the end of Ranieri’s term – when Roman Abramovich had made his investment. We find that Jose Mourinho actually made up for the decline under David Moyes and Louis van Gaal, and then started losing it. In that sense, Manchester United have got their sacking timing right (though they were already in decline by the time they finished last season in second place). Manchester City also seem to have done pretty well in terms of the timing of managerial changes. And Spurs’s belief in Mauricio Pochettino, who started off badly, seems to have paid off. I wonder why Elo Ratings haven’t made more impact in sports other than chess! So the Football World Cup season is upon us, and this means that investment banking analysts are again engaging in the pointless exercise of trying to predict who will win the World Cup. And the funny thing this time is that thanks to MiFiD 2 regulations, which prevent banking analysts from giving out reports for free, these reports aren’t in the public domain. Different banks have taken different approaches to predict who will win the tournament. UBS has still gone for a classic Monte Carlo simulation approach, but Goldman Sachs has gone one ahead and used “four different methods in artificial intelligence” to predict (for the third consecutive time) that Brazil will win the tournament. In fact, Goldman also uses a Monte Carlo simulation, as Business Insider reports. The firm used machine learning to run 200,000 models, mining data on team and individual player attributes, to help forecast specific match scores. Goldman then simulated 1 million possible variations of the tournament in order to calculate the probability of advancement for each squad. But an insider in Goldman with access to the report tells me that they don’t use the phrase itself in the report. Maybe it’s a suggestion that “data scientists” have taken over the investment research division at the expense of quants. I’m also surprised with the reporting on Goldman’s predictions. Everyone simply reports that “Goldman predicts that Brazil will win”, but surely (based on the model they’ve used), that prediction has been made with a certain probability? 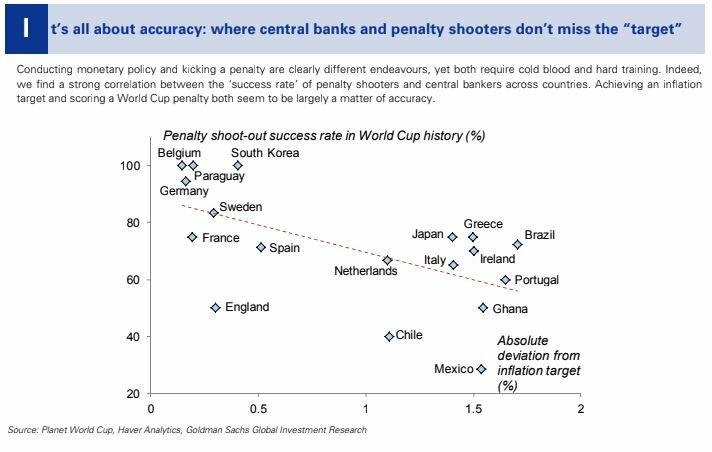 A better way of reporting would’ve been to say “Goldman predicts Brazil most likely to win, with X% probability” (and the bank’s bets desk in the UK could have placed some money on it). ING went rather simple with their forecasts – simply took players’ transfer values, and summed them up by teams, and concluded that Spain is most likely to win because their squad is the “most valued”. Now, I have two major questions about this approach – firstly, it ignores the “correlation term” (remember the famous England conundrum of the noughties of fitting Gerrard and Lampard into the same eleven? ), and assumes a set of strong players is a strong team. Secondly, have they accounted for inflation? And if so, how have they accounted for inflation? Player valuation (about which I have a chapter in my book) has simply gone through the roof in the last year, with Mo Salah at £35 million being considered a “bargain buy”. Nomura also seems to have taken a similar approach, though they have in some ways accounted for the correlation term by including “team momentum” as a factor! Anyway, I look forward to the football! That it is live on BBC and ITV means I get to watch the tournament from the comfort of my home (a luxury in England!). Also being in England means all matches are at a sane time, so I can watch more of this World Cup than the last one. Top marks for England’s squad numbers. Sterling makes sense as 10. Right-backs being 2, 12 and 22 is exceptional. Vardy the right type of striker for 11 with no proper left-winger in the squad. Young 18, Rashford 19, Alli 20 same as for clubs. 13 and 23 keepers. Textbook. Now, there is some science to how football shirts are numbered. I had touched upon it in a very similar post I had written four years ago. You can also read this account on how players are numbered. And if you’re more curious about formations and their history, I recommend you read Jonathan Wilson’s Inverting the Pyramid. To put it simply, number 1 is reserved for goalkeepers. Numbers 2 to 6 are for defenders, though some countries use either 4, 5 or 6 for midfielders. 7-11 are usually reserved for attacking midfielders and forwards, with 9 being the “centre forward” and 10 being the “second forward”. Some of these numbers are so institutionalised that the number is sometimes enough to describe a player’s position and style. This has even led to jargon such as a “False Nine” (a midfielder playing furthest forward) or a “False Ten” (a striker playing in a withdrawn role). There is less science to the allocation of shirt numbers 12 to 23, since these are not starting positions. One rule of thumb is to allocate these numbers for the backups for the corresponding positions. So 12 is the reserve goalie, 13 is the reserve right back and so on(with 23 for the squad’s third goalkeeper). There is no surprise in Number 1, which all teams have allocated to their goalkeeper, and numbers 2 and 3 are mostly allocated to defenders as well (there are some exceptions there, with Iran’s Mehdi Torabi and Denmark’s Michael Krohn Dehli wearing Number 2 even though they are midfielders, and Iceland midfielder Samuel Friojonsson wearing 3). That different countries use 4, 5 or 6 for midfielders is illustrated in the data, though two forwards (Australian legend Tim Cahill and Croatia’s Ivan Perisic) puzzlingly wear 4 (it’s less puzzling in Cahill’s case since he started as a central midfielder and slowly moved forward). 7 is the right winger’s number, and depending upon that position’s interpretation can either be a midfielder or a forward. 8 is primarily a midfielder, while 9 is (obviously) a striker’s number. Interestingly, five midfielders will wear the Number 9 shirt (the most prominent being Russia’s Alan Dzagoev). 10 and 11 are evenly split between midfielders and forwards, though two defenders (Serbia’s Aleksandr Kolarov and Tunisia’s Dylan Bronn) also wear 11. Beyond 11, there isn’t that much of a science, but one thing that is clear is that Cox got it wrong – for it isn’t so “textbook” to give 12 to the reserve right back. As we can see from the data, 20 teams have used that number for their reserve goalies! It’s like England has put their squad numbers into a little bit of a Mixer! So I was just looking down the English Premier League Table for the season, and I found that as I went down the list, the goal difference went lower. There’s nothing counterintuitive in this, but the degree of correlation seemed eerie. So I downloaded the data and plotted a scatter-plot. And what do you have? A near-perfect regression. I even ran the regression and found a 96% R Square. In other words, this EPL season has simply been all about scoring lots of goals and not letting in too many goals. It’s almost like the distribution of the goals itself doesn’t matter – apart from the relegation battle, that is! PS: Look at the extent of Manchester City’s lead at the top. And what a scrap the relegation is! Tomorrow Liverpool plays Manchester City in the Premier League. As things stand now I don’t plan to watch this game. This entire season so far, I’ve only watched two games. First, I’d gone to a local pub to watch Liverpool’s visit to Manchester City, back in September. Liverpool got thrashed 5-0. Then in October, I went to Wembley to watch Tottenham Hotspur play Liverpool. The Spurs won 4-1. These two remain Liverpool’s only defeats of the season. I might consider myself to be a mostly rational person but I sometimes do fall for the correlation-implies-causation bias, and think that my watching those games had something to do with Liverpool’s losses in them. Never mind that these were away games played against other top sides which attack aggressively. And so I have this irrational “fear” that if I watch tomorrow’s game (even if it’s from a pub), it might lead to a heavy Liverpool defeat. And so I told Baada, a Manchester City fan, that I’m not planning to watch tomorrow’s game. And he got back to me with some statistics, which he’d heard from a podcast. Apparently it’s been 80 years since Manchester City did the league “double” (winning both home and away games) over Liverpool. And that it’s been 15 years since they’ve won at Anfield. So, he suggested, there’s a good chance that tomorrow’s game won’t result in a mauling for Liverpool, even if I were to watch it. With the easy availability of statistics, it has become a thing among football commentators to supply them during the commentary. And from first hearing, things like “never done this in 80 years” or “never done that for last 15 years” sounds compelling, and you’re inclined to believe that there is something to these numbers. I don’t remember if it was Navjot Sidhu who said that statistics are like a bikini (“what they reveal is significant but what they hide is crucial” or something). That Manchester City hasn’t done a double over Liverpool in 80 years doesn’t mean a thing, nor does it say anything that they haven’t won at Anfield in 15 years. Basically, until the mid 2000s, City were a middling team. I remember telling Baada after the 2007 season (when Stuart Pearce got fired as City manager) that they’d be surely relegated next season. And then came the investment from Thaksin Shinawatra. And the appointment of Sven-Goran Eriksson as manager. And then the youtube signings. And later the investment from the Abu Dhabi investment group. And in 2016 the appointment of Pep Guardiola as manager. And the significant investment in players after that. In other words, Manchester City of today is a completely different team from what they were even 2-3 years back. And they’re surely a vastly improved team compared to a decade ago. I know Baada has been following them for over 15 years now, but they’re unrecognisable from the time he started following them! Yes, even with City being a much improved team, Liverpool have never lost to them at home in the last few years – but then Liverpool have generally been a strong team playing at home in these years! On the other hand, City’s 18-game winning streak (which included wins at Chelsea and Manchester United) only came to an end (with a draw against Crystal Palace) rather recently. 80-year history of a fixture has no bearing since teams have evolved significantly in these 80 years. So saying a record stands so long has no meaning or predictive power for tomorrow’s game. City have been in tremendous form this season, and Liverpool have just lost their key player (by selling Philippe Coutinho to Barcelona), so City can fancy their chances. That said, Anfield has been a fortress this season, so Liverpool might just hold (or even win it). All of this points to a good game tomorrow! Maybe I should just watch it!